he asked for the warehouse key impolitely and the driver refused to give it to him – I wasn’t surprised at all, but my question why does this nonsense always happens in our region ?! really we should grow up – anyways everything was settled, we fixed the IMAX camera on top of the bus, and took a drive on the bus to test that everything is working properly, some officers stopped us and they wasted over an hour of our time checking our approvals from the government and trying to explain to them that it’s a movie about the Mecca and Haj.. but you know these type of things were a pain throughout our filming days, what you really don’t want is a stupid guy who isn’t cooperating and eventually wastes a shot in an important day during Haj that was planned for years. 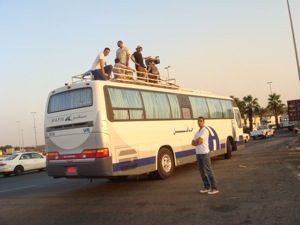 The Bus shot got canceled because the roads leading to Mecca at that time weren’t crowded with buses as we wanted them to be, so the whole day was like a complete waste of time and money ! but things like this do happen a lot as I kept learning, this causes uncontrolled frustration to the team.. but this is filmmaking. 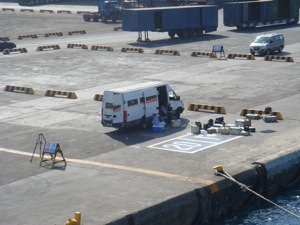 We had a rigging prep at the warehouse, as usual, testing the equipment, making sure that all things are set and ready. Then our line producer Daniel Furgeson gave us a speech as well as Jonathon Barker, one of the producers. So here we were shooting boats arriving to Jeddah port carrying pilgrimages, these boats were filled with so many people, it was unbelievable ! 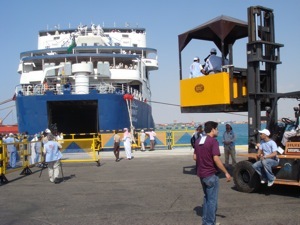 we had to wake up at sunrise and come early, but didn’t do anything until 12:am where the first boat arrived from Sudan, we went inside the ship with our steadycam and took some shots on board, then after the day was over we came back to the warehouse to pack the equipments. This is where the real fun begins !! 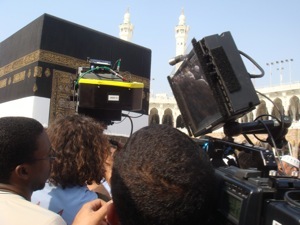 today we are heading to Mecca, we gathered at 10am, and went to the warehouse at 2pm.. yea waiting for whoever was late, then before we seperated from the rest of the crew (non-muslims) our Director, Producers gave us a farewell speech. As mentioned the director didn’t come along with us, along with the executive producers and the whole IMAX technicians, so instead we had a Muslim assistant director with us calling the shots, Abdulatif Salazar, and at the end of each day, Bruce our director who was in a area just close to Mecca took a look at the dailies, the shots, and gave us his feedback, this wouldn’t happen anywhere else besides Mecca, that the Director wasn’t allowed to be with us. So after everyone was set and ready, we made our move to Mecca ! The path was smooth to Mecca apart from a car bumping to us which is expected during Haj, it was ever so slight so nobody got hurt, then as soon as we arrived we unloaded our equipment to the basement under the Haram (Holy site), we got late because of some officials making sure of our approvals and paperwork (yes again), we then slept at around 3am. 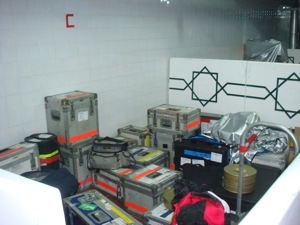 Our equipment, you can notice the C letter on the wall, corresponding to the Steadycam unit, unit C, we had guards with us 24/7 guarding that area. 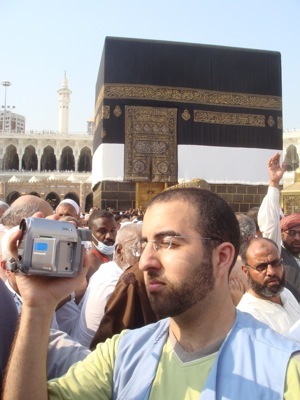 We still had issues with the paperwork and the guards (yup again and again), but today it was our first time inside the near the Ka’ba with the IMAX camera !! the IMAX camera is so heavy, that in order to move it around 2 people are required for that task, we had some guards with us to make us way through the crowd without bumping into someone or getting people hurt, as soon as that was taken care of, we settled in our position and took our first track-in steadycam shot, it was really nice ! 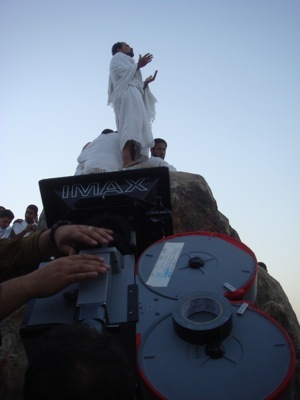 As we are shooting we had the film magazine stuck twice, some time got lost fixing those issues. After we finished from the day we headed back to our hotel, it was so crowded that I was carrying a heavy backpack with me and it took me 2 hours to past the people and arrive to the hotel, it was aaa.. terrible. Our shooting call was at 10am, we went to our location and noticed that the camera doesn’t work.. again ! 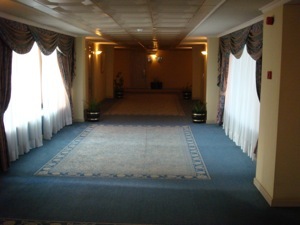 we had to use another IMAX camera from the other unit’s team, I had to go to the basement several times, back and forth, getting essential items from the basement, and what got me frustrated more that someone from our team quit, so I had that moron’s work to do besides mine, then as we came back to the hotel, all our money from our production team got stolen, yea someone took it, then we eventually found out later that it was the same guy who quit that did it !! and guess what, he forgot to leave the money under his bed pillow !! what a stupid thief ! The feeling today was great, I’m walking light and no need to carry any cases along, what a relief ! All units were off today, except for unit A, which they had a time-lapse shot of the Haram from above the roof of Al-Marwa hotel, the highest at that time. So I decided to check on them and see what they were up to…. The view from above, beautiful. 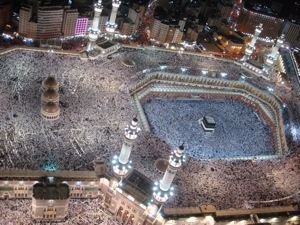 It was the most amazing view I ever saw, the Haram was filled with thousands of people !! 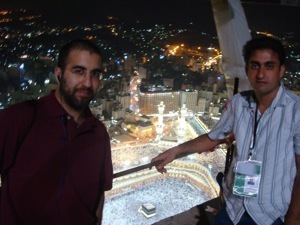 We even managed to pray during Isha time on the roof, you basically can see the Ka’ba just under you ! After finishing, I got myself a foot massage in the hotel – I was surprised they had one in our hotel- and saw our unit C fellas there too, then we had a rest. 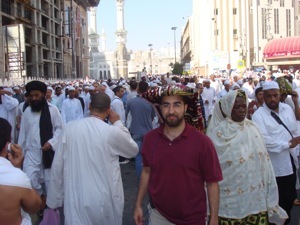 Tawaf is one of the Islamic rituals of pilgrimage. 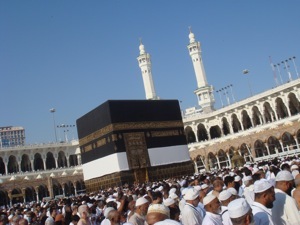 During the Hajj and Umrah, muslims are to circumambulate the Ka’bah (the holiest building in Mecca) seven times, in an anti-clockwise direction. 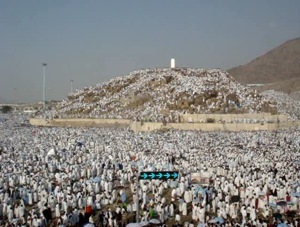 The circling is believed to demonstrate the unity of the believers in the worship of the One God, as they move in harmony together around their central shrine, while supplicating to God “Labbaik Allahumma Labbaik“. Probably the hardest days of them all, we faced several issues with the camera, many people kept looking at the camera and were waving and all that, so most of our shots weren’t that good, expect for mere seconds, on Sunday, four of our members got sick including me, we talked to pilgrimages to act as extras and let them walk in a path while we followed them with the steadycam revealing the Ka’ba at the end, it looked good, but on one of the shots there was kid waving at the end, he ruined it, we had to repeat that shot many times to get it right, the Haram began to be crowded and we didn’t have anything to eat, so we waited desperately for the hotel restaurant to open since they were closed during the prayer time. After our shots were done, we packed at night getting ready to go to Arafat, but I wasn’t there help to pack the stuff to the truck at night coz I was dead sick, I had to regain strength at the hotel, but one stupid assistant was trying to talk to move me to another unit because he saw me not working, he’s like playing it by the book and not thinking about what I had worked on today despite my health, what a jerk ! I didn’t let it happen and he shut his mouth. 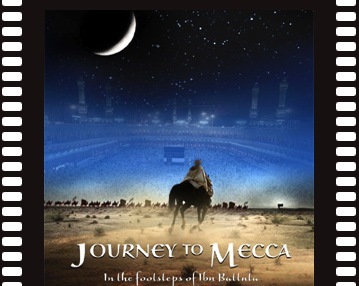 Stoning of the Devil or stoning of the jamarat is part of the annual Islamic Hajj pilgrimage. 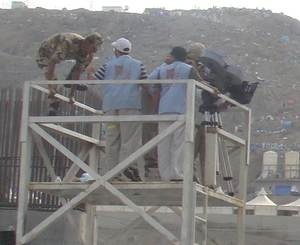 Muslim pilgrims fling pebbles at three walls called jamarat in the city of Mina just east of Mecca. 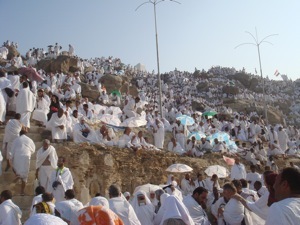 It is one of a series of ritual acts that must be performed in the Hajj. Aside from the crowds and long walk to reach our destination, the shots we took were quite good, we didn’t come to any problems with the camera thank god now that the camera got fixed. 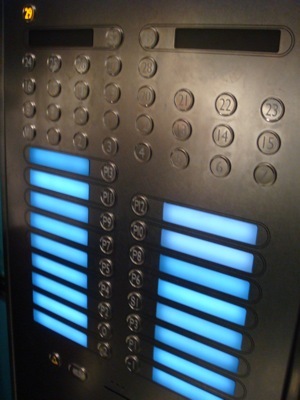 But some stupid official came rushing up the stair, and barged shouting !! stop the cameras ! and that’s after we showed him the papers, and after he approved us to get up and shoot, but u know .. he changed his mind, check it out ! Clean, clean you 3rd camera assistant ! 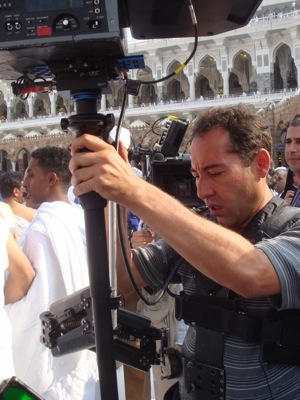 As I mentioned above, that’s only the first part of the filming, but the challenge of shooting on the Haj, is like attending the actual Haj – for whom that went before- but with the extra effort of carrying heavy boxes, tripods .. etc. 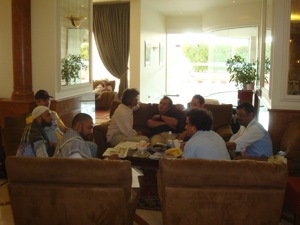 So it was the most difficult part, not to mention the layers of bureaucracy that was needed to get through before the shooting began, that’s why the project started circa 2002-2003 but took time to get the approvals for the filming inside the Haram and especially besides the Ka’ba, which was the first time that ever happened in history. 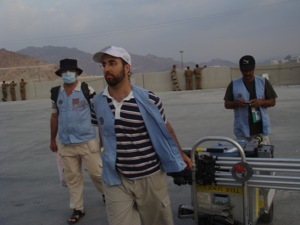 I had a great experience being part of the crew, there were immense sharing going on between us, because there were people who knew about the Haj and some people knew things about filmmaking, we had top of the line technicans with us, people that did logistics and catering, but I think it was the combination of those things that made it all work, we all learnt from one another and from our mistakes, and filming during an uncontrolled environment only made the challenge even harder, making teamwork crucial. 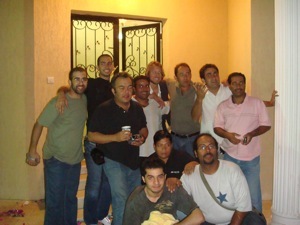 After a few months another team was formed in Morocco to shoot the drama part of the movie, after that was over, the film got edited in Canada, and premiered for the first time to the public in Abu Dhabi on January 7th 2009.
wow very good reading! I enjoyed it :) I’ll make sure I don’t miss this movie..
I’m interested in making a documentary movie!! i’ll check the video. Definitely gonna watch it ! Nice pictures. it seems like a really hard work. Would love to see this work. Great job ma shaa Allaah. When is it going to be on theatres in Kuwait? Another question, on what theatres? Scientific Centre? Ma Shah Allah aleek! Alleh Ekleek! 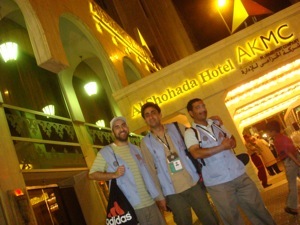 Moham Ali From Satellite TV Inc.
Wallah ahmed this is a great experience for you.. This brought back so many memories of when I spent 2 summers working with my brother who builds movie sets and props for hollywood movies. 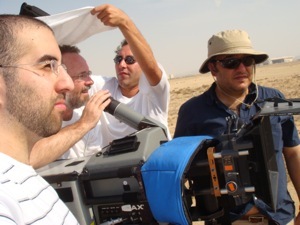 He had 2 crews on movie locals and another crew on a television movie, so I spent time on all 3 projects. I really loved working with “artistic people”. They are so creative, spontaneous and FUN. Plus they love to party whenever they get the chance. The unknown secrets of movie making. Continued success to you. Professionally logos and corporate identities can play critical role to a business success. That’s why ADAM IT Solutions provide unique logo and corporate identities to our customers, which can uniquely represent them all over the world. Your logo is the first image with your customers. An icon or colors that represent everything behind each company and the message that it transmits. ADAM IT Solutions creative design team will be able to provide you with the most unique, sophisticated and modern logo that will portray your company’s history, services and Impression. foods cause acne breakouts. More importantly, you will learn the best ways to counter each of these contributing factors of acne. Possibly limit your hair duration or pull it back, to reduce the extra oil that comes in contact with your skin.